Does the habit get caught in the wheels? The Case of the Sin City Sister concerns searches for missing family members. Sister Evangeline Divine (pronounced Di-VEEN) is a Harley riding nun who has become entranced with her father's private detective business. Her father Jackson, a retired cop, lives in Madrid, New Mexico. Sister Eve takes a leave of absence from the convent to help her father when she learns her sister Dorisanne has gone missing. Dorisanne lives in Las Vegas, and has always had money troubles. Her husband Robbie is a known gambler and troublemaker, and the family worries that he's dragged her into his troubles. At the same time, the detective agency gets a new case: to find out what happened to a man who came to the area in the 1880s to mine turquoise, but was never heard from again. Skeletal remains have been found in a cave, and a man from North Carolina hears about it and wonders if the body could be that of his long lost great-great grandfather. So much time has passed that the Divines are unsure what they can find out, but they take the case and set to work. Another client asks Jackson to dig on his property to see if he can find any of the rumored gold that's buried there. 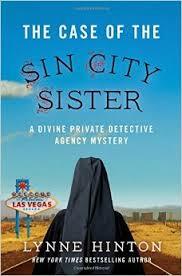 Sister Eve decides that she has to go to Las Vegas to see if she can trace Dorisanne's movements. Although she's perfectly content with her plans to ride her Harley all the way to Vegas, her father has other ideas. Daniel, a current cop and her father's former partner, takes a leave of absence to travel to Vegas with Eve. It seems that Daniel is quite fond of Las Vegas, and goes there rather frequently. The pair begin at Dorisanne's apartment, where they meet Pauline, a neighbor and fellow casino cocktail waitress who seems to have befriended Dorisanne. Pauline has problems of her own, but she agrees to speak with Eve, even though she claims not to know much about Dorisanne's mysterious departure. As Eve and Daniel investigate, they begin to notice several strange people and vehicles following them. Could they be connected to Dorisanne's disappearance? I enjoyed the unconventional Sister Eve and her adventures, which included being stranded in a hospital morgue and hot-wiring a motorcycle. She has to make a decision about whether or not to return to the convent, but given her love of investigation, it won't be easy for her to choose one life over the other.